The last time I visited The Swan at Salford it was Father’s day 2015 and I’d treated my dad to one seriously tasty flat iron steak. None of us had ever had a flat iron steak before… The Swan seem good at whipping out a special. I don’t know why I haven’t been back since. Laziness I suppose? It’s a little out of my way in a pretty village. I was invited to dinner and arrived to see that others certainly weren’t avoiding it, with plenty of people enjoying a post-work wine in the garden (lot’s of serious power dressing!). Inside was just as busy and nearly every table filled on a Thursday evening! It’s pub that does the gastro vibe very well: modern, cosy, country. The menu was noticeably fishy. Definitely more sea creatures present on this menu than your average pub. Certainly no bad thing for a fish lover, particularly in the Summer. 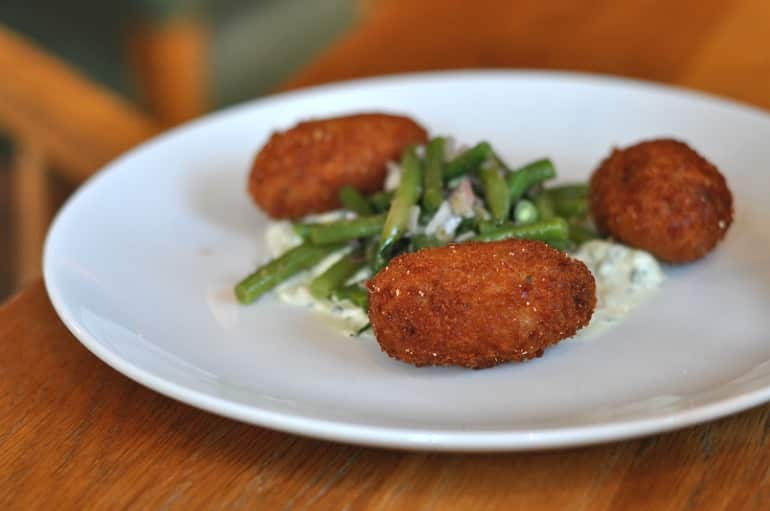 Q however, forever faithful to his land animals, steered clear and opted to kick off the meal with chicken and ham hock croquettes with a green bean salad. 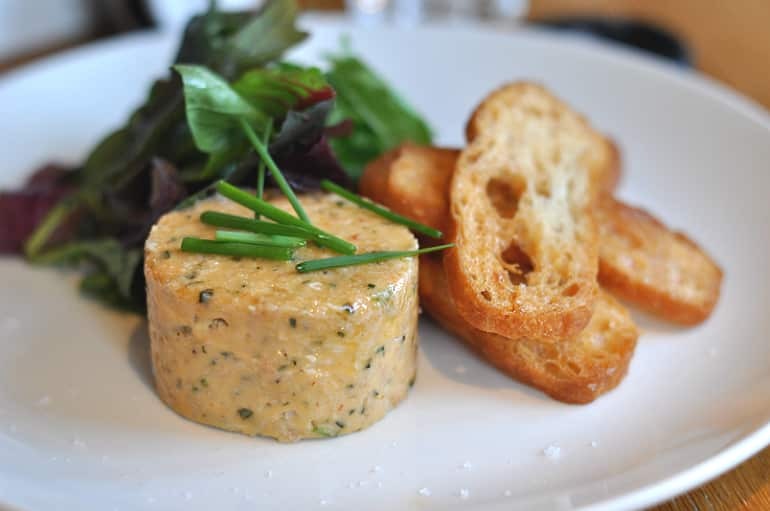 I chose potted crab: a generous portion of buttery smooth crab meat that was cool and refreshing, served with crunchy ciabatta toasts. Very delicious, albeit a little samey towards the end with a lack of anything sweet or sharp to cut the cool flavour. Q pretty much ordered his favourite dish for his main: duck two ways with white cabbage and a potato and spring onion rosti. I was lucky enough to have a few forkfuls of this come my way and it was wonderful. 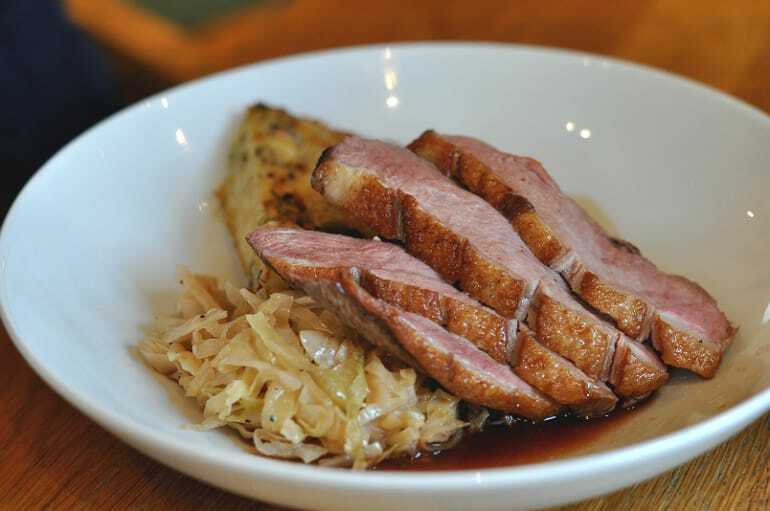 Perfectly cooked, juicy duck breast and a rich confit duck leg. What this dish lacks in colour it sings in taste! The warm Summer evening must have got to me as I ordered something light. 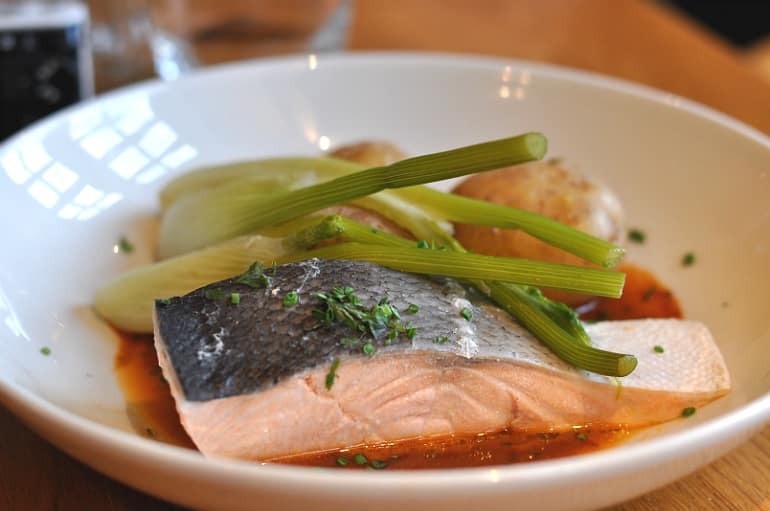 A guilt free poached salmon fillet with new potatoes and roasted fennel was my main. It was simple but beautifully executed. The fish was gorgeous and I savoured every bite. The meal is finished with a lobster sauce that adds a lovely rich tone; absolutely luscious when soaked up into your potatoes! 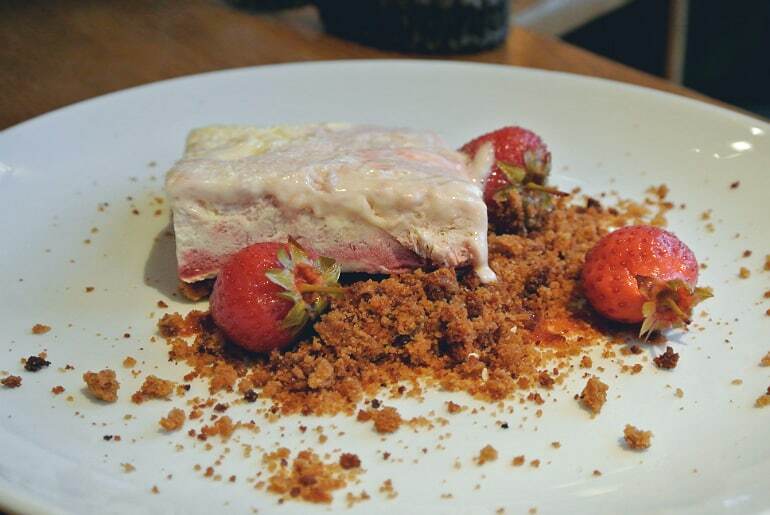 Iced strawberry parfait. Those three words sounded so damn good together I was sold. It was everything I hoped it would be: cool and creamy with a layer of intensely sweet iced strawberry puree. What a great Summer dessert! Loved the ginger crumbs too. Q ordered a blueberry cheesecake. This is a strange thing to like, but nonetheless I really did like that this arrived in the non-traditional triangle slice. 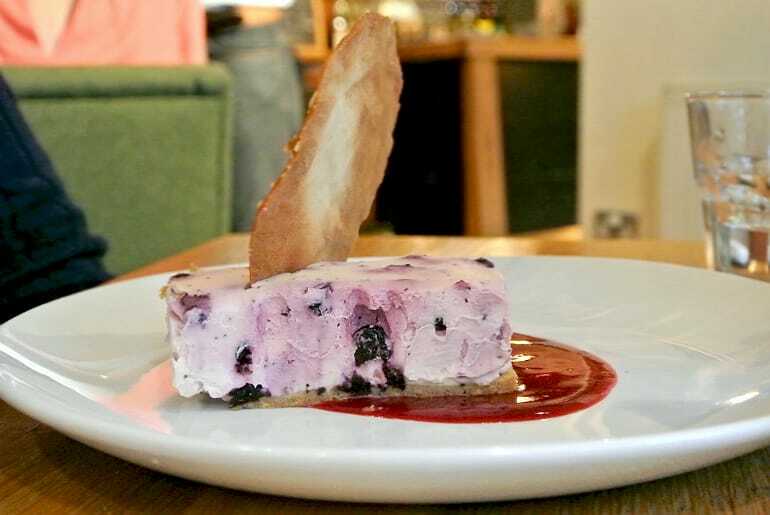 I think the look of those blueberries in the rustic cream cheese mix is just beautiful. Nicely done, Swan! A tasty round of dishes. Service was a tad slow given how popular they were that evening, but not once did the staff appear rushed when attending to us. 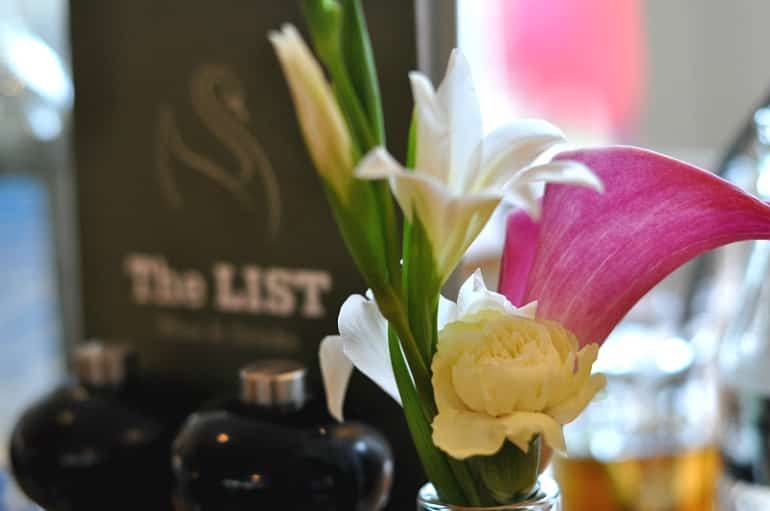 I saw lots of smiles and warm comments as they visited each table, making it a very friendly pub to be in and keeping the experience relaxed. 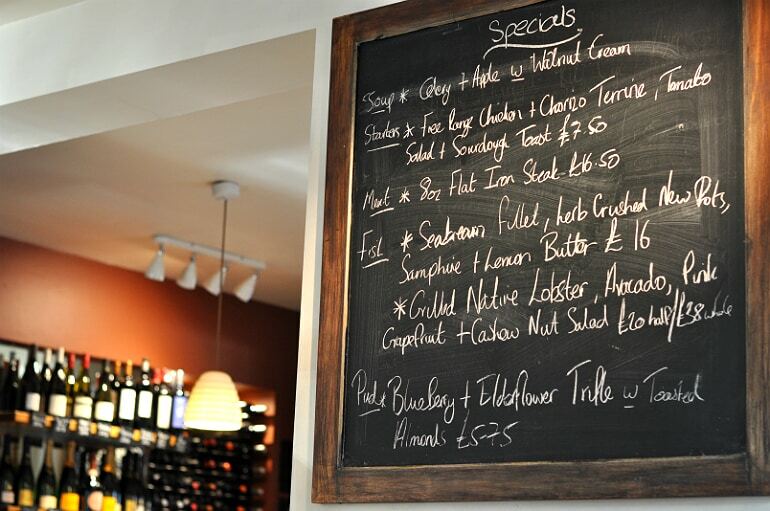 The Swan actually have a lobster special going at the moment (told you they love a special!) and the half lobster and fries smothered in garlic butter I saw coming out gave me some serious food envy. Next time I guess!